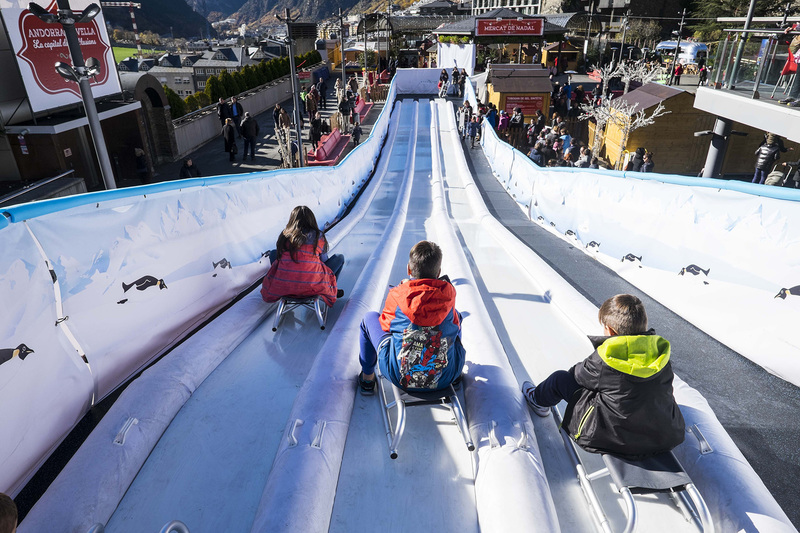 From 1 to 30 December, during the Christmas Market’s opening hours, children can make the most of a spectacular 35-metre-long synthetic ice toboggan. Younger children must enter and exit accompanied by an adult. Each participant can go down the toboggan twice. Participants must not set off on the sledge until the monitor in charge says so, as they will be checking that the previous participant has arrived at the end of the slide. Andorra la Vella City Council accepts no responsibility for any accidents caused by misuse of the toboggan. From Monday to Thursday: from 5 to 8 p.m. Friday: from 5 to 9 p.m. Saturdays and days 6, 7, 24, 26, 27 and 28: from 11 a.m. to 2 p.m. and from 3.30 p.m. to 9 p.m. Sundays: from 11 a.m. to 2 p.m. and from 3.30 p.m. to 7 p.m.